It turns out that jet lag and guns don’t mix and Tony copped a bit of friendly fire in the foot during his tour of duty in Afghanistan. I’m sure that low bastardry is strictly forbidden under the New Paradigm Conventions and Julia’s not one to set a political, er, ambush.Â Shut up Kevin. 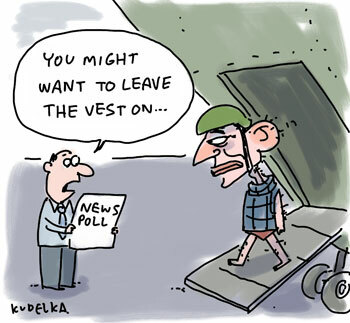 Posted in political cartoons, The Australian.